Into the Ruins: Winter 2017 is Now Available! I’m pleased to announce that the fourth issue of Into the Ruins is shipping to subscribers and is now available for purchase! 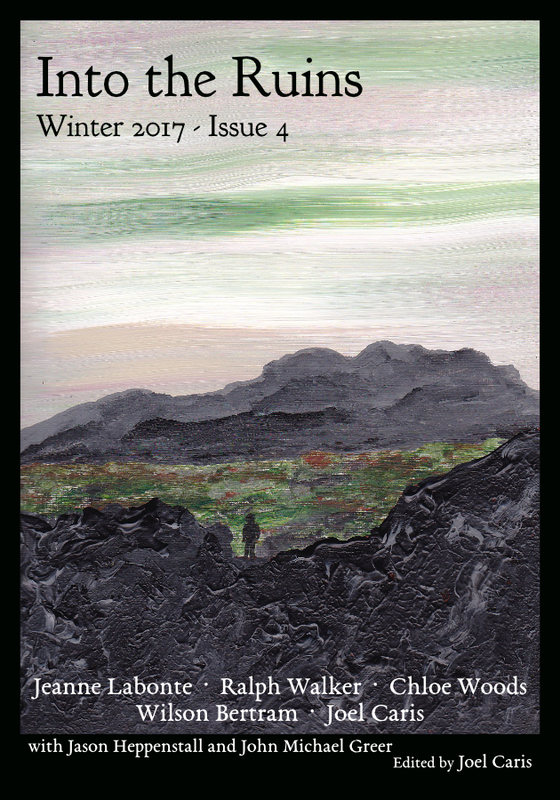 This Winter 2017 issue features five excellent new stories, including the tale of an abandoned and dilapidated old church in the woods with a lively history of religion and scandal; a story of communication and friendship between species; the search for a particular treasure in the flooded remains of a great American city; a Cardinal’s fascinating letter about surprise visitors from the sea; and a near future tale of social unrest that plays off the uncertain political mood of the day. Also included is a new “Deindustrial Futures Past” column from John Michael Greer, reviews of deindustrial science fiction novels, and another thought-provoking letters section, making this an issue not to be missed. For those of you who have followed my blog on the Figuration Press website, Litterfall, you’re in for what I hope will be a treat: my own story, “An Expected Chill,” completed and ready for your reading pleasure. Also, I’ve heard the calls for the title to be printed on the spine; consider it done! Subscribers should be receiving their issues within the next week or so—all subscriber orders have been placed as of this weekend. For the vast majority of you subscribers, that means your subscription has come to an end. For those of you who have already renewed their subscription, thank you, thank you, thank you! For those who haven’t, you can do so right here. I hope you’ll join me for a second year of Into the Ruins, and I hope that you’ll consider doing it soon; it helps me tremendously to know how many subscribers I’m going to have for the fifth issue, which is a big part of how I set my author payment rates. This project has so far been a massive success—I really hope that continues to be the case! So please, renew if you haven’t already. Okay, with that out of the way, for those who aren’t ready to subscribe but who would like to check out the fourth issue anyway, you can order a copy here to peruse at your pleasure. In addition to ordering directly at the previous link, you can order from Amazon. For Canadian readers, the issue is available on Amazon’s Canada site. For other international readers, you can go to the issue page for links to international Amazon sites it’s available at or for a link to order directly from CreateSpace, which ships throughout the world. Finally, a digital version will be available soon through Payhip for $7.50. I’ll make an announcement when that’s available. As always, I encourage readers to send their thoughts and feedback to me at editor@intotheruins.com, both as casual emails (rambling acceptable!) and as official letters to the editor that I can consider for publication in the fifth issue of Into the Ruins, coming in May. Comments for contributing authors will be happily forwarded on—and I’ll note that I would love to hear direct feedback on my own story from anyone who’s inclined to provide it. Lastly, I want to once again provide a huge thanks to John Michael Greer for his myriad forms of support; Shane Wilson, who continues to prove a steady and invaluable Associate Editor, providing feedback and catching mistakes I otherwise miss; Jason Heppenstall, for contributing a book review to this issue; my amazing partner, Kate O’Neill, who is ever patient, ever loving, and brings me happiness every single day; to those who wrote letters to the editor and who have helped diversify the views available in the magazine; W. Jack Savage, for again providing such a beautiful cover, and for working with me unendingly (and unendingly, and unendingly); and of course to all the fantastic authors published herein, whose imaginative works form the backbone of this publication and, ultimately, are the reason it exists. And finally, to everyone who has subscribed or purchased issues, thank you for supporting this project and helping to make it happen. Now go read the issue and enjoy some fantastic deindustrial and post-peak science fiction! Next Post What Do You Hope For? For story submissions, please clarify are you purchasing all rights? Or are you purchasing only first publication rights with the rights returning to the author after their story has been published? That would be good extra detail to include on the submissions page. I’ll look at getting that up there. But to answer your question, the contract is for first serial publication rights, exclusive for six months from the first date of publication and nonexclusive thereafter.